Update 4/9/19: There has been a lot of confusion around this story, the difference between “sponsored” and “promoted,” and the devices being affected. Read the update below for clarification. Update 4/3/19: A Google spokesperson released a statement on the Android TV sponsored posts issue (below). We’ve seen a few OEMs insert ads into their Android devices. Most notable is Xiaomi, but even they have recently come out and said they will work on this in a future update. There are others though, including Samsung, which lets you choose whether or not you want to see ads in various areas of the OS. These can be quickly disabled thanks to a settings option, but it looks like a recent update to Android TV has begun to display ads directly in the launcher. At first glance, there didn’t seem to be a way to disable them, but that has rarely stopped us enthusiasts from figuring it out. Android TV owners recently received an update across multiple platforms that have started to display sponsored content with a “Promotional Channels’ title in the launcher of the Android TV software. We’re currently seeing reports that it has shown up in Sony smart TVs, the Mi Box 3 from Xiaomi, NVIDIA Shield TV, and others. This has been an incredibly off-putting change for a lot of Android TV users. What makes matters worse is people were unable to disable the ads at first, but Reddit user Felisens seems to have figured out how to disable them. In their post, they say you need to “uninstall the updates” for the “Android TV Core Services” app (com.google.android.tvrecommendations). You should be aware that doing this will crash the home screen but you can push through it by pressing the Home button to restart it. With this app’s updates rolled back, you can either rearrange the home screen and use the minus button to get rid of these ads or you can go to the channel settings page and you’ll see a toggle to disable them. This toggle seems to only be present in the older version of the app though, so you’ll want to go in and disable automatic updates for this particular application to prevent the toggle from being removed again. We have reached out to Google for a comment on this change and will update this article if we hear back from them. There has been a lot of confusion around this story. Google has reached out to us to clarify what is exactly going on here. Basically, people are confused about the difference between “sponsored” and “promoted” content. The “sponsored” row is only appearing on select Sony devices as part of a pilot program. The sponsored row is not appearing on devices from Xiaomi or NVIDIA. What most users are seeing is a “promoted” row from the Play Store. 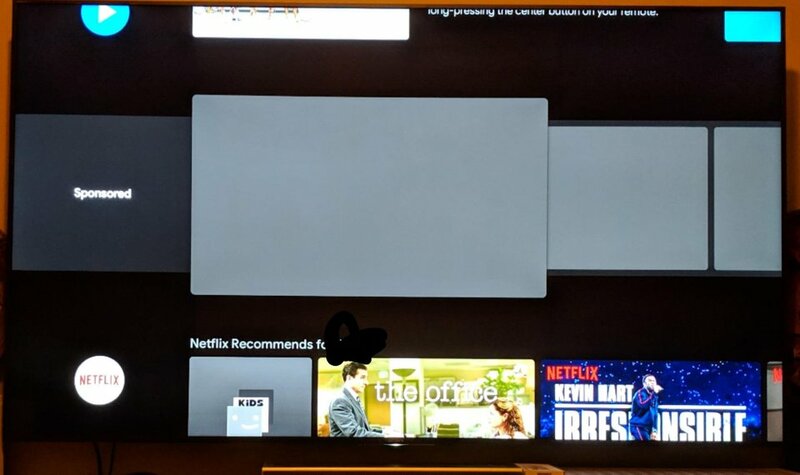 The promotional channel has been a feature of the Android TV launcher for a while, but a recent bug caused the “Apps Spotlight” row to constantly reappear despite being disabled. I expirienced this bug on my NVIDIA Shield TV. It is not related to the sponsored content. In short, some Sony devices are seeing sponsored content, but most Android TV users are expiriencing an unrelated bug.